This great scene has a skeleton in a gold glitter mask pounding an orange-masked skeleton. 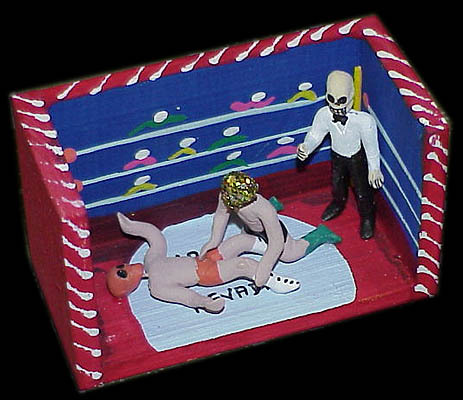 The referee seems to be ignoring the carnage, while the orange-masked skeleton begs for mercy. The canvas reads “Las Vegas Nevada”. *Calacas: Handmade skeleton figurines usually showing an active and joyful afterlife.